As I merge onto the Sunset Highway at five o’clock on a Friday, rush-hour traffic is already stacking up. I swerve into the left-hand lane and begin to think through my packing list. Like usual, my plan to get everything ready the night before didn’t happen. I managed to pile gear in the basement but didn’t actually pack it. Now we’re leaving in an hour and I’m staring at brake lights until the horizon. They say a caged rat can be trained to navigate a maze for food. The rat can memorize the route, but when the food is replaced with a five-foot drop, that rat will run right off the edge without stopping. Psychologists call this a behavioral script. It’s doing things without recognition or control, and I’m weaving through traffic on autopilot. 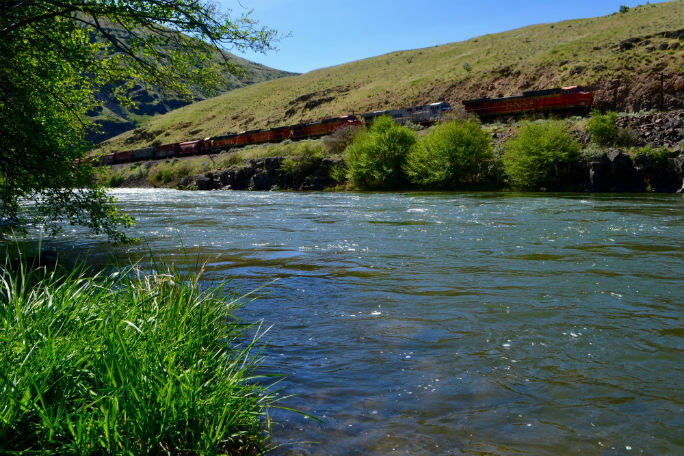 The Deschutes River begins high in the Cascade Mountains of Oregon. It flows through the town of Bend, into Lake Billy Chinook, past the Warm Springs Indian Reservation, and into a desert canyon. This desert canyon is known as the Lower Deschutes and it’s a 97-mile section from Lake Billy Chinook to the Columbia River. I’m planning to float the lower 44 miles, from Buck Hollow to Heritage Landing with my friends Jake, Kyle, and Tom. We all like to get outside, but the time we actually spend outside has been shrinking. Jake is an Art Director for an advertising firm. Kyle and Tom are both architects, and I used to work seasonal jobs outside, but for the past four years I’ve been office-bound as a copywriter on the 9-5. 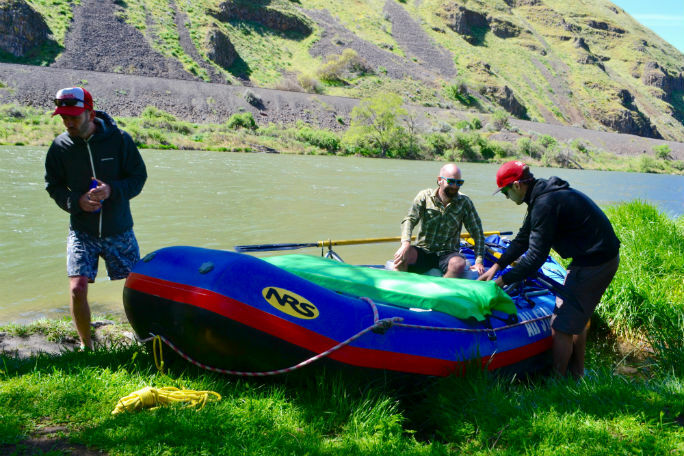 None of us own a boat, so I’ve reserved a 14-foot oar rig from All Star Rafting in Maupin. They’ll meet us at Buck Hollow at nine on Saturday morning with an inflated raft and then shuttle Tom’s Jeep to the take-out. All this comes at a price of course, but it’s more than worth it. We need as much time on the river as our weekend can afford. After fighting rush hour traffic, I get home, finish a frantic packing job, and meet the guys at Tom’s house. We grab a burrito for the road, and now, after a week of planning, the Portland skyline is fading in the rear view of Tom’s Jeep Cherokee. We cruise I-84 through the Columbia River Gorge and past the high waterfalls that drop from the forested mountains above. For the past two years, Tom, Jake, and I have run the Rogue River in southern Oregon. This year we didn’t have enough PTO to warrant the Rogue again, so we’re settling for the nearby Deschutes. Tom and I have both floated sections before. Jake has never floated it, and Kyle, the newest member of our group, has never been on an overnight river trip. The forecast calls for a sunny 82 degrees, and we’re pumped. 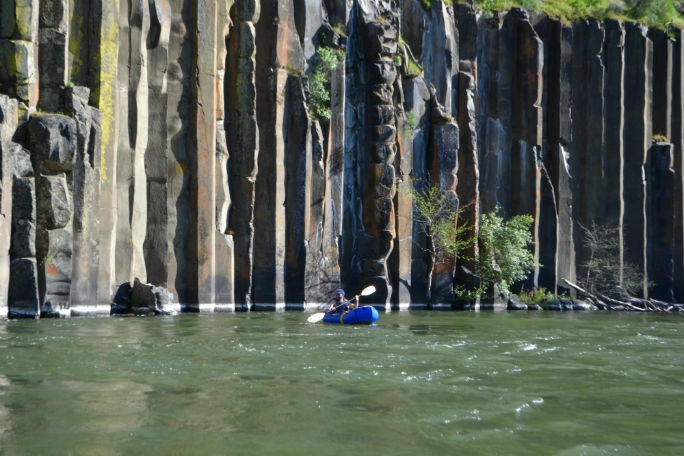 This stretch of the Deschutes is the most popular overnight trip in all of Oregon. It’s not technical water, but it’s a heavy river pulling tributaries from a host of Cascade volcanoes to form a strong, muscular current. There are 15 named rapids that culminate in four Class III rapids within the last five miles. From what I’ve read, these Class IIIs don’t require technical moves, but they deserve their rating because they form large, straightforward wave trains. We leave I-84 for a state highway that takes us down to the river. We follow the riverside road watching for deer in the headlights, and when we pull into Twin Springs Campground, it appears no one else is camped there. As we step out of the Jeep the first thing I notice is the river. I can’t see it, but it fills my ears with sound. We set up our tents and as our eyes adjust to the moonless night we notice the stars above are brighter than they’d ever be in the city. The interconnecting galaxies are splattered between the stars like the stringy meat of a pumpkin a mess with seeds. It’s been far too long since the last time I camped out. Was it five months ago or eight? What I do know is that it feels good. We drink a few beers, then a few more, and the stars spin overhead as we break free from our work-a-day world. The next morning Travis is waiting for us at Buck Hollow. The raft is inflated. The frame is rigged. I sign my life away on the bottom line, and Travis drives off as we pack up the raft. We strap the dry bags into the back, load the cooler with fresh ice, and everyone lathers on sunscreen. Tom and I give the raft a shove. The weight of the boat leaves the gravity of the ground, and it bobs a little as we settle into our seats. I place the oars into the water for that first stroke and try to find my form. Whatever hassles I endured to get here, I can’t remember them now as our little boat begins to descend the mighty Deschutes. The rising sun throws the canyon into sharp, angled relief. The sugary smell of cottonwood buds float in the air. I pull a few hard strokes to get a feel for the boat. With the four guys and all our gear, the boat feels heavy, but manageable, and so I ask Kyle to grab us all a beer. It’s only ten on a Saturday but the moment calls for it. We all crack one open and cheers. After the first bend, we pass beneath a railroad bridge and I hear a white roar. I ask Jake to grab the Boater’s Guide and see what it says. He untucks the guide from the cooler strap and skims the book. The roar is getting louder so I pull a few strokes to stall for time. The current is pushing us toward a drop on river left. The bulk of the current pours over a snaggletoothed rock that has a nasty hole that looks like a gaping mouth. I pull a few more strokes. On river right the water spreads across rocky shoals. There are little tufts of grass where a Canadian goose sits with its fuzzy goslings watching our progress. “You read it from bottom to top,” Tom says and grabs the book. I steer into the current. It grabs us with the astonishing strength of water. Each stroke is like dipping the oars into concrete. Nothing budges as I pull, but the leverage allows me to angle the boat so the bow is facing that snaggletooth. That way I’ll have my strongest stroke available if we get too close. The forward stroke in this water is useless unless I was Vin Diesel, which I’m not. I actually don’t know much about rafting. I’ve never been a whitewater guide. I’ve never been on a guided trip. I just started small, made plenty of mistakes, learned from them, and kept at it. Over the years I’ve become solid in Class III rapids, but Class IV still make my palms sweat. I watch YouTube videos for weeks before I run one of those, but this rapid seems straightforward. We ride down the glassy v-tongue into the chaos. The foaming mouth chomps and gnashes. I pull a quick stroke to center us and we plunge headfirst into the whitewater. A cold wave explodes over us and someone in the front unleashes a primal yell. Afterward, Jake figures out how to read the Boater’s Guide and says that was Wreck Rapid, our first Class III. Apparently it got its name from a head on train collision in 1948 where a few boxcars tumbled down to the river. As if on cue, we hear a thunderous rumbling down canyon. It’s the Burlington Northern Santa Fe heading up to Bend. It has orange and black boxcars and graffiti tags on nearly every one. The contents are a mystery to us, and the train seems nearly a mile long. 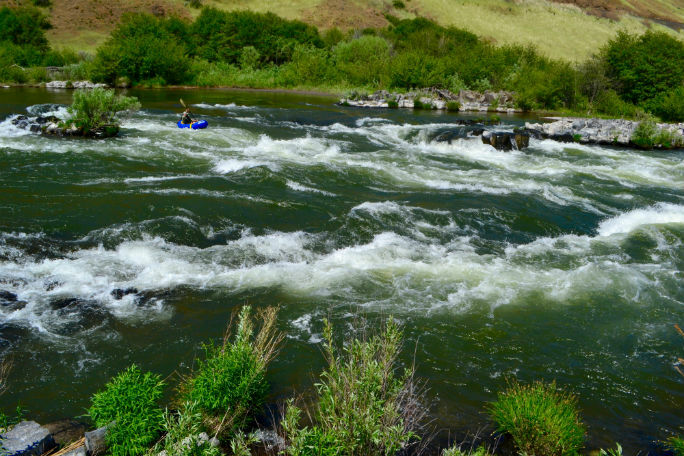 The Lower Deschutes River was designated a Wild and Scenic River in 1988. The Bureau of Land Management manages the area, and it feels relaxed. 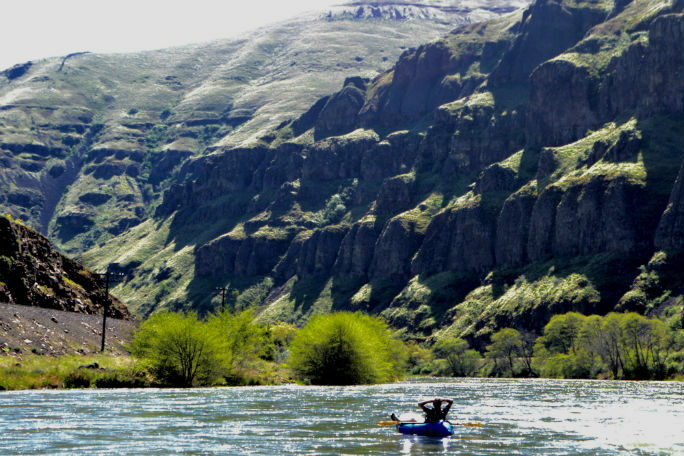 Unlike the lottery systems of the Rogue, Snake, and Salmon, the Deschutes has an easy permit system. You go online, get a pass, and print it out. Anyone with some gumption can run it, which isn’t to say it doesn’t present challenges, but they’re manageable. All you need is the motivation to get out here. 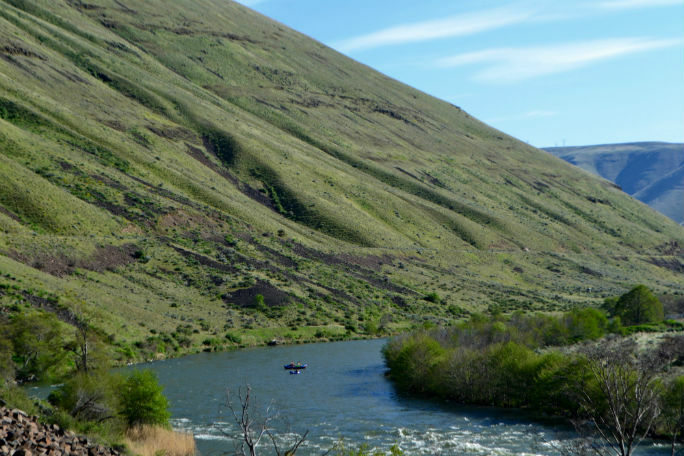 The Lower Deschutes can get crowded, but there are abundant campsites to handle the masses. On this day, however, we have the river to ourselves and we are drifting through the canyon like the only people on earth. The walls rise nearly 2,000 feet above us with basalt cliffs that band the steep, grassy slopes. We can see the whitewash of dry falls, window rocks, and caves among the high cliffs. It looks like the perfect hideout for outlaws in the Wild West, but the only inhabitants today are winged creatures and bighorn sheep. 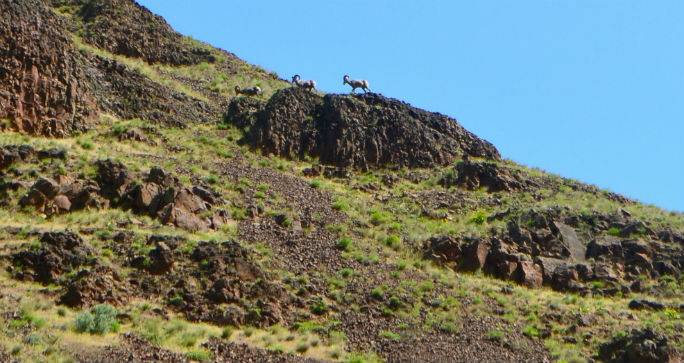 It doesn’t take us long before we spot a group of three surefooted bighorns walking along the rocks. We take turns on the oars and in a packraft Tom brought along. Without upcoming rapids to worry about, we all drink more beer than we should. It’s hard not to. After 40+ hours behind a computer screen, the effect of this canyon is intoxicating. My gaze is fixed to the canyon walls high above, but small obstacles present themselves along the way. Beached trees, boomerang currents, and scattered rock gardens keep us alert on the oars. But we’re falling into a rhythm, where it all feels natural, like we belong out here. The Boater’s Guide shows us at Homestead Camp, a horseshoe bend in the river with an island. The next camp is called Snake in a Box and we unanimously agree we don’t want to use that toilet, so we eye a camp a few miles farther called the Airstrip. Many of these camps have names that reference the history along the river. 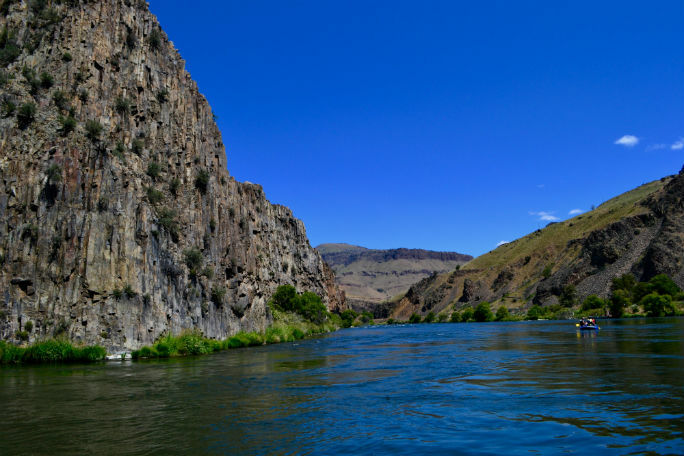 Native tribes hunted, fished, and traveled along the Deschutes for thousands of years. Much of their culture revolved around the salmon migration, and today the natives still dip net for them at Sherars Falls. It’s a spectacular sight. They’ve built wooden walkways that extend over the falls. They walk out with 20-foot poles with five-foot nets attached. Some use a rope and a harness, others just stand at the slippery edge. It looks like a full body workout to hold that net in the churning water. When a salmon hits, they scoop upward and run the long pole hand-over-hand as fast as they can. It seems an efficient way to fish, but only the natives are allowed to dip net here. Clouds blow in, covering the sun. The temperature drops and a strong wind begins to blow up canyon. I spin the raft so my back is facing downriver and I start to row with all I’ve got. We’re in the homestretch now to the Airstrip and the wind is gusting across the river in sheets. I row and I row and I row against the wind. Once we spot the Airstrip, we tie our raft to an alder, unpack, and set up camp in a flat meadow. 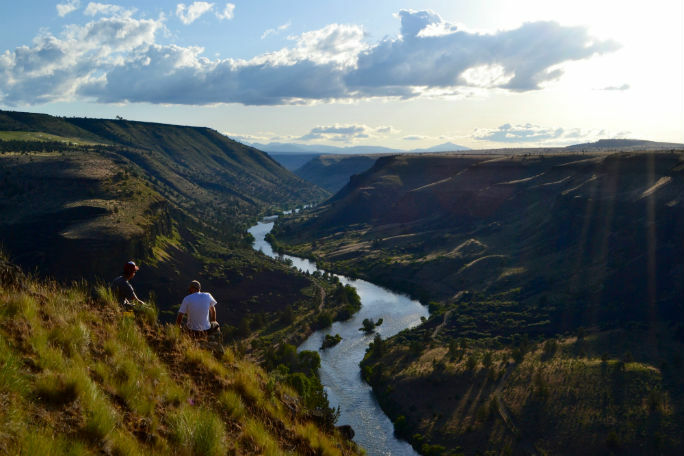 We pitch our tents in the tall sagebrush, and then hike up the canyon for a view of the river. The sunlight is fading on the canyon wall, and we can see for miles. There’s not another person in sight, and it’s incredible to know that we are only two hours away from the busy city we call home. We pass the night at camp as any group of overworked young men would. We drink, play games, and cook dinner over a campfire. The clouds scatter as stars overtake the night. We huddle around the campfire with our hands stretched out talking about how we should get out here more. I tell them how the Deschutes from Warm Springs to Maupin has even bigger rapids, including Whitehorse Rapid, which is a half-mile-long Class III. We promise to take off early on Fridays to maximize our weekends. It’s the kind of talk that happens around the campfires of every weekend warrior. We’re in the moment of our ambition but we’re already planning more. This will be the Summer of Rivers we declare, and we tick off a list of all the ones we wish to float. A sickle moon rises above the canyon wall, and it hangs there like an old hat. We finish our stew, crush our beer cans, and make our way to our tents. I’m looking forward to a hard night’s sleep beneath the stars. 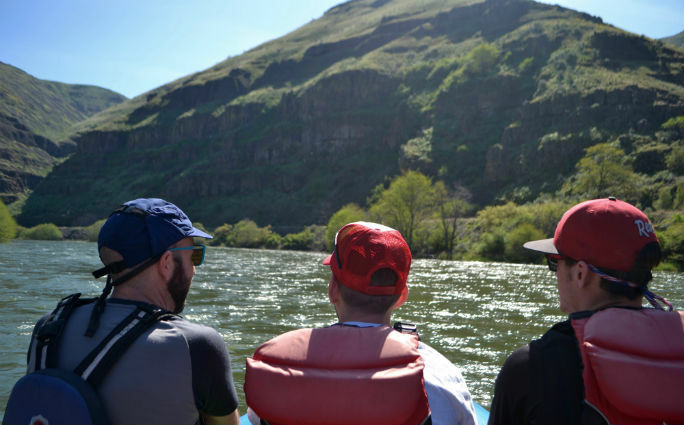 Tomorrow, we have 17 more miles to go, and four of the biggest Class III rapids yet. I crawl into my sleeping bag hearing nothing but the river as I drift off to sleep. It’s all beginning to feel normal and I start to dream of how I can make this my new routine.